A-PDF PPT to EXE (PPT Screensaver Creator) is a simple, lightning-fast and powerful desktop utility program that lets you to convert PPT file to professional EXE file or screensaver file. The EXE (.SCR) file can be copied to any computer and will run on Windows without running any additional program. A-PDF PPT to EXE Converter runs easily and independently.A-PDF PPT to EXE Converter can perfectly convert the PowerPoint PPT file. ...... on computers or mobile devices where PDF Viewer is not installed or not supported then you should convert PDF into AVI or WMV video file. Everyone can easily read EXE files. 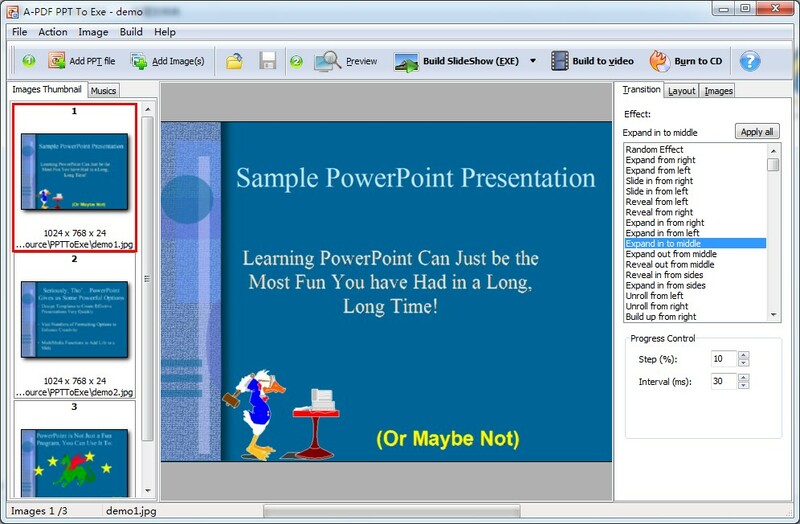 If you want to send someone your PowerPoint presentation, or distribute it via the internet or through data CDs, the best way to ensure that everyone can read your presentation (no matter whether they have installed the needed version of PowerPoint on their computers) is to convert to a self-running EXE file using PPT to EXE Converter. A-PDF PPT to EXE Converter can be run without Microsoft PowerPoint installed. And the converted self-running exe file does not require Microsoft PowerPoint installed on your viewer's computer too. Compile asp project into exe file, make to ASP files to EXE. Qweas is providing links to A-PDF PPT to EXE 1.6 as a courtesy, and makes no representations regarding A-PDF PPT to EXE or any other applications or any information related thereto. Any questions, complaints or claims regarding this application A-PDF PPT to EXE 1.6 must be directed to the appropriate software vendor. You may click the publisher link of A-PDF PPT to EXE on the top of this page to get more details about the vendor.